Wildlife removal is a neccessary service offered to eliminate any unwanted nuisance animals on residential or commercial properties. Wildlife removal has become a private paid service not offered by the local municipalities. What the municipalities do offer is domesticated animal services such as dog, cat,and pet services. 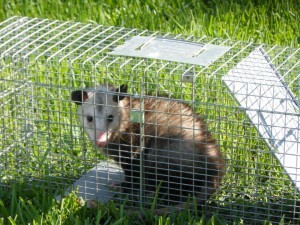 Some municipalities do offer wild animal pick ups if they are already safely secured in a trap. Not all municipalities offer pick up services. Often I am asked what to expect when calling a wildlife removal service. Most companies will have to do a property inspection. This is done to identify and target the proper nuisance animal even if you think you know which animal is there. I have often been told by a customer that they have seen the and it was a for example a opossum. When I arrived I was doing a proper property inspection and found not only an opossum but a skunk living by the a/c unit and rats in the attic. Once the animal is identified the proper wildlife removal method for that state must by followed. There are often many proper removal methods to get rid of the wild animal. The situation is very different for every call because of all the different variables involved. Every house or business is different, every animal is different, every climate of which state you live in is different, every situation is new no matter if it the exact same animal. For instance I went on six different wildlife removal calls for raccoons last March and did six different wildlife removal methods. The first call was a male raccoon under a porch and I was able to kick the porch enough to scary him into leaving. I then repaired the hole and reinforced it so he could not get back in. 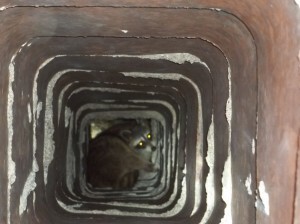 Second call was a raccoon in a chimney. Turned out the raccoon was dead so I had to suit up and by hand remove him. The sold a full coverage chimney cap to stop any further raccoons from entering. Third call was a mother raccoon in an attic. She had just given birth and the babies were still pink and only about the size of mouse. Raccoon eviction was use to deter her from staying and she left that night with her babies out of the attic. Fourth call was a raccoon in a wall. I could not tell if it was a mother so I set traps and caught her the next night. I could tell she had given birth within the last week so I went back to where I thought she was and cut a hole in the wall and found the pups. Relocated them all together. Fifth call was a raccoon mother in a chimney with pups so I seperated her from the chimney and grabbed the pups. 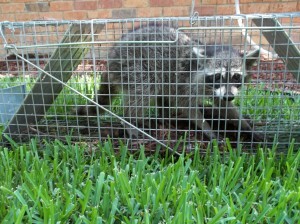 Put them in the back yard in a box and the mother raccoon came back and relocated them off the property. Of course I sold a chimney cap. The last call of the day happened to be raccoons in an attic again. It happened to be a male raccoon sleeping in the corner of the attic above the front dormer. I set traps and did not catch this guy at all. He ended up leaving on his own and I sealed up the entry point two weeks later. I checked on this customer a week after the repair and they said they have seen or heard anything in over two and a half weeks. After you have read the above paragraph you can understand why pricing and quantity of work cannot be quoted over the phone. Sometimes what seems simple turns into a two week process and sometimes what might look like the end of the world is an easy pick up and removal. Animal in the attic is a very common removal situation. Bats, raccoons, squirrels, birds, and opossums are the most common offenders to enter an attic for shelter. Raccoon removal from attics, sofits, chimneys, and under porches or foundations is a common situation for hiring a nuisance wildlife removal service. Squirrels are one of the most common offenders in the nuisance wildlife removal industry. A squirrel removal can be tricky if you are trained in the proper successful removal methods. Armadillo digging up your yard is often found in the lower half of the United States. How to get rid of an armadillo can be tricky. There is more to it than just setting a trap and waiting for an armadillo to get caught. Bats in the attic are a common nuisance situation. Bat removals are extensive and can be illegal if not done at the proper time of the year or done incorrectly. An opossum removal is a service necessary in all 48 main land states. Not the smartest of Gods creatures, but has adopted well to human habitat. The ability to climb and dwell in trees has made the opossum safe from predators. Every nuisance wildlife service listed here knows how to get an opossum out of an attic. A snake in the garden is a service call for the nuisance wildlife industry almost everyday. With so many kinds of snakes to identify, people play it safe to have them removed just in case they are poisonous. Birds nesting is a national problem for residential and commercial properties. Bird proofing keeps birds from nesting or perching and also keeps the bird droppings to a minimal. Dead animal removal is a dirty job. The removal of a dead animal can be hazardous to your health and carry disease. The proper removal methods for removing a dead animal and then correctly cleaning and sanitizing the infected area is not to be taken lightly. Beaver removal takes a highly trained professional to perform correctly. After the beavers are relocated the beaver dam may need to be removed correctly. How to get rid of a skunk for a clean skunk removal is often tricky for anyone. Even for a nuisance wildlife removal professional. Trapping a skunk is not hard. Knowing how to get rid of a skunk in a trap without being sprayed is a challenge even for the best trained professional. Rats in the attic is a problem in all 50 states. Rat removal procedures must be followed for a successful elimination of rats from any property. Wildlife removal services do not use pesticides of any kind.